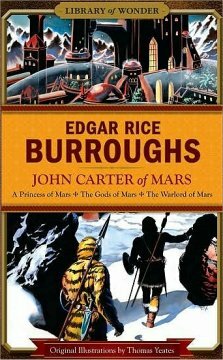 Edgar Rice Burroughs saved the best for last in his famous trilogy: A Princess of Mars, Gods of Mars, and Warlord of Mars. 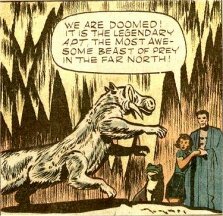 As Carter fights his way from the South Pole to the North Pole as he tries to rescue his incomparable princess, Dejah Thoris, and stamp out the false religion of Issus, he encounters the North Pole's Great Ice Barrier, the Carrion Caves, and the land of Okar. Okar is a gloomy, barren world of ice and crevaces which lies between the pole and the Great Ice Barrier. It is populated by Yellow Men with beards who live in hothouse cities, which create a man-made paradise under their crystal-glass domes. It is within these cities that the final drama of the trilogy is played out and where John Carter becomes the Warlord of Mars. “It is a huge, white-furred creature with six limbs, four of which, short and heavy, carry it swiftly over the snow and ice; while the other two, growing forward from its shoulders on either side of its long, powerful neck, terminate in white, hairless hands, with which it seizes and holds its prey. “Its head and mouth are more similar in appearance to those of a hippopotamus than to any other earthly animal, except that from the sides of the lower jawbone two mighty horns curve slightly downward toward the front. “Its two huge eyes inspired my greatest curiousity. They extend in two vast, oval patches from the center of the top of the cranium down either side of the head to below the roots of the horns, so that these weapons really grow out from the lower part of the eyes, which are composed of several thousand ocelli each. 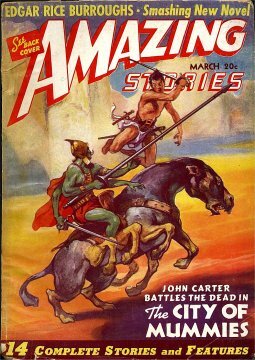 “‘The ancient chronicles of the first historians of Barsoom – so ancient that we have for ages considered them mythology – record the passing of the yellow men from the ravages of the green hordes that overran Barsoom as the drying up of the great oceans drove the dominant races from their strongholds. “‘These from whom you have just saved me are warriors he has sent out to find and slay me, for they know that often I come alone to hunt and kill the sacred apt which Salensus Oll so much reveres. It is partly because I hate his religion that Salensus Oll hates me; but mostly does he fear my growing power and the great faction which has arisen throughout Okar that would be glad to see me ruler of Okar and Jeddak of Jeddaks in his place. “‘He is a cruel and tyrannous master all hate, and were it not for the great fear they have of him I could raise an army overnight that would wipe out the few that may remain loyal to him. My own people are faithful to me, and the little valley of Marentina has paid no tribute to the court of Salensus Oll for a year. Talu convinces Carter and Thuvan Dihn that it is expedient to visit his city of Marentina before they proceed on to the capital city of Kadabra. It is likely that in Kadabra they will find Dejah Thoris and Thuvia since Salensus Oll is a radical believer in Issus and would have easily given aid and comfort to the leader of the Holy Therns. “The way was over some of the worst traveling I have ever seen, and I do not wonder that in this land where there are neither thoats nor fliers that Marentina is in little fear of invasion; but at last we reached our destination, the first view of which I had from a slight elevation a half-mile from the city. “Nestled in a deep valley lay a city of Martian concrete, whose every street and plaza and open space was roofed with glass. All about lay snow and ice, but there was none upon the rounded domelike, crystal covering that enveloped the whole city. “The Marentina atmosphere plant will maintain life indefinitely in the cities of the north pole after all life upon the balance of dying Mars is extinct through the failure of the air supply, should the great central plant again cease functioning as it did upon that memorable occasion that gave me the opportunity of restoring life and happiness to the strange world that I had already learned to love so well. “He showed us the heating system that stores the sun’s rays in great reservoirs beneath the city, and how little is necessary to maintain the perpetual summer heat of the glorious garden spot within this arctic paradise. “Broad avenues of sod sewn with the seed of the ocher vegetation of the dead sea bottoms carried the noiseless traffic of light and airy ground fliers that are the only form of artificial transportation used north of the gigantic ice-barrier. “The broad tires of these unique fliers are but rubber-like gas bags filled with the eighth Barsoomian ray, or ray of propulsion – that remarkable discovery of the Martians that has made possible the great fleets of mighty airships that render the red men of the outer world supreme. It is this ray which propels the inherent or reflected light of the planet off into space, and when confined gives to the Martian craft their airy buoyancy. “The groud fliers of Marentina contain just sufficient buoyancy in their automobile-like wheels to give the cars traction for steering purposes; and though the hind wheels are geared to the engine, and aid in driving the machine, the bulk of this work is carried by a small propeller at the stern. Talu takes them to a barber who gives them fake beards and a lotion to put on their skin to give them a yellow pigment. Appearing as Yellow Martians, they are given orange and black striped fur suits made from the orluk – another arctic monster – and leave Marentina for Kadabra. Talu gives Carter a special ring that makes a pricking sensation in his flesh when it comes into close proximity with one of its mates, worn by Talu's spies in Kadabra. “That very evening we came into sight of the walled and glass-roofed city of Kadabra. It lies in a low depression near the pole, surrounded by rocky, snowclad hills. From the pass through which we entered the valley we had a splendid view of this great city of the north. Its crystal domes sparkled in the brilliant sunlight gleaming above the frost-covered outer wall that circles the entire one hundred miles of its circumference. The gates are all closed for the day and they wait until the next morning to gain entrance. “The shaft was a mighty magnet, and when once a vessel came within the radius of its powerful attraction for the aluminum steel that enters so largely into the construction of all Barsoomian craft, no power on earth could prevent such an end as we had just witnessed. Carter learns that the shaft is called the Guardian of the North. Several hundred warriors exit through the nearest gate of the city and fall upon any survivors, and as Carter and Thuvan Dihn enter the city, a pack of fierce, gold-collared apts is loosed upon the wreckage to finish whatever the warriors missed. “Then they led me through long corridors to a court far toward the center of the palace. “For a day I was left in darkness; and then, quite suddenly a brilliant light illumined my strange cell. I was reasonably hungry and thirsty by this time, not having tasted food and drink since the day of my incarceration. “To my amazement I found the sides of the pit, that I had thought smooth, lined with shelves, upon which were the most delicious viands and liquid refreshments that Okar afforded. “With an exclamation of delight I sprang forward to partake of some of the welcome food, but ere ever I reached it the light was extinguished, and, though I groped about the chamber, my hands came in contact with nothing beside the smooth, hard wall that I had but felt on my first examination of the prison. “Immediately the pangs of hunger and thirst began to assail me. Where before I had but a mild craving for food and drink, I now actually suffered for want of it, and all because of the tantalizing sight that I had of food almost within my grasp. “‘You need not more than step from this room for an instant when I give you the signal. I will do the rest, and then, when I am gone, you may come and throw the great switch back in its place, and all will be as before. I need but an hour’s start to be safe beyond the devilish power that you control in this hidden chamber beneath the palace of your master. See how easy,’ and with the words the black dator rose from his seat and, crossing the room, laid his hand upon a large, burnished lever that protruded from the opposite wall. “Thurid approached and examined the handle of the lever. “As I looked in the direction he indicated I saw the cause of his perturbation. A mighty fleet of fliers was approaching majestically toward Kadabra from the direction of the ice-barrier. On and on they came with increasing velocity. “Never in my life have I seen such wondrous swordsmanship and such uncanny agility as that ancient bag of bones displayed. He was in forty places at the same time, and before I had half a chance to awaken to my danger, he was like to have made a monkey of me, and a dead monkey at that. “It is strange how new and unexpected conditions bring out unguessed ability to meet them. 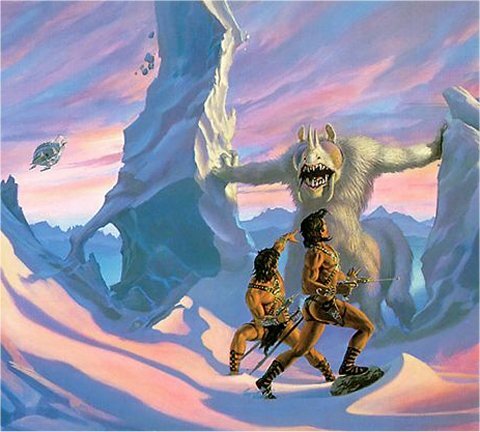 The lessons learned make Carter such a sword master that he is voted at the end of the novel the Warlord of Barsoom. “‘What has all that to do with your being in the pits of Horz?’ I demanded. “‘Not correct,’ she contradicted. ‘There is a nation of red men occupying a considerable area, but at some distance from Okar. I am under the impression that when you were there the Okarians themselves had never heard of these people. and were received in peace. “Their leader, whose name was Hin Abtol, was a pompous braggart. He was an uncultured boor; but, as our guest, he was accorded every courtesy. He said that he was Jeddak of Jeddaks of the North. My father said that he thought that Talu held that title. “‘My father told him that all the arable lands were settled and belonged to other nations which had held them for centuries. Hin Abtol is keeping his word as he lays seige to Gathol. Carter puts on the red pigment he received from the Ptor brothers, and by a ruse, enters Hin Abtol’s camp. He manages to deceive the drunken Admiral of Hin Abtol’s fleet and receives command of one of Hin Abtol’s obsolete ships, the Dusar. He discovers that most of Hin Abtol’s men hate him and that few of them are Panars but captured men from other places. He learns that Hin Abtol has taken Llana back to Pankor and enlists a non-Panar crew to help him, one of them being his old friend, Tan Hadron of Hastor. “Gor-don led the way with confidence over that trackless waste to a narrow gorge that split the hills. One unfamiliar with its location could have passed along the foot of the hills within a hundred yards of its mouth without ever seeing it, for its ice – and snow – covered walls blended with the surrounding snow to hide it most effectively. 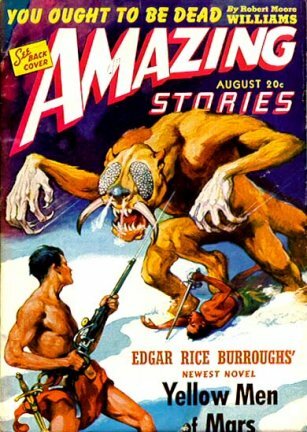 They are attacked by an apt, which I mention because the scene appears both on the cover the original August 1941 issue of Amazing Stories – drawn by J. Allen St. John – where it first appeared, and on the cover of the Ballantine pocket book edition illustrated by Michael Whelan. (See ERBzine #0738.) We will discuss the drawing by J. Allen St. John in more detail below. “He led us out of the market place and along an avenue of poorer shops, to the city wall. Here, beside a small gate, was a shed in which was a stock of aptfur suits. After we had each donned one of these, in accordance with the officer’s instructions, he unlocked the small gate and led us out of the city into the bitter cold of the Arctic, where such a sight met my eyes as I hope I may never see again. On row after row of racks which extended as far as I could see hung frozen human corpses, thousands upon thousands of them, hanging by their feet, swinging in the biting wind. “Each corpse was encased in ice, a transparent shroud through which their dead eyes stared pleadingly, reproachfully, accusingly, horribly. Some faces wore frozen grins, mocking Fate with bared teeth. “‘It is part of Hin Abtol’s mad scheme to conquer all of Barsoom and make himself Jeddak of Jeddaks and Warlord of Barsoom. 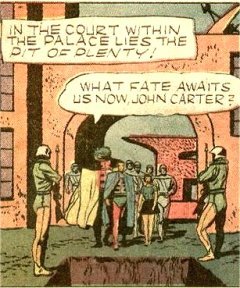 He has heard of the famous John Carter, who holds these titles; and he is envious. He has been at the preserving of human beings by freezing for fully a hundred years. At first it was only a plan by which he might have great numbers of slaves available at any time without the expense of feeding them while they were idle. After he heard of John Carter and the enormous wealth of Helium and several other empires, this grandiose scheme of conquest commenced taking form. “‘He had to have a fleet; and as no one in Pankor knew how to build airships, he had to acquire them by trickery and theft. A few crossed the ice barrier from some of the northern cities; these were lured to land by signals of friendship and welcome; then their crews were captured and all but one or two of them frozen in. Those who were not had promised to train Panars in the handling of the ships. It has been a very slow process of acquiring a navy; but he has supplemented it by visiting several of the northern cities, pretending friendship, and then stealing a ship or two, just as he pretended friendship for Gahan of Gathol and then stole his daughter. “‘How many of those frozen men has he?’ I asked. in Pankor, and then Ul-to, the greatest swordsman of Pankor, both of whom he easily defeats. His discovers that Llana of Gathol is beside Hin Abtol in the crowd and subtlely directs her to the flier while he slowly hacks Ul-to to pieces. He maneuvers Ul-to close to the flier just as Hin Abtol notices Llana in the flier and calls an alarm. 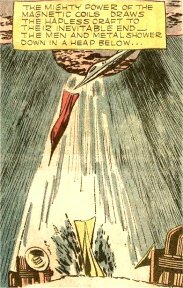 All hell breaks loose as Carter finishes off Ul-to, Llana lifts off the flier, Carter leaps on board, then together at last, they escape Pankor by crashing through the crystal dome. Those that claim that ERB was not a true science fiction author can’t really have read about the Third Wonder of Barsoom. There are more marvelous inventions in the hothouse cities than to be found in most classic science fiction stories. Under these crystal domes, we find sunray tanks and atmosphere factories generating summer and springlike temperatures, airy ground fliers, a massive shaft-magnet, and an advanced form of a law enforcement fax-like machine that is still futuristic even by today's standards. 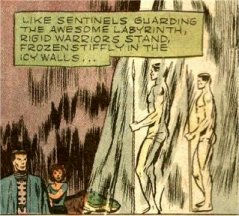 Outside of the domes are terrible arctic monsters and a million men frozen in suspended animation. The dilemma raised by this title is obvious. The Panars, unlike the Yellow Men from Okar, are Red Men. The only yellow man ever mentioned is Talu, rebel prince of Marentina, and that mention only appears in “The City of Mummies,” not in “The Yellow Men of Mars.” This really disturbed me. What could possibly be the reason for this strange title? Having studied political science in college in the late Sixties and Early Seventies, with an emphasis on Soviet Foreign Policy, my first theory was that because of the changing political climate between 1940 and 1948, ERB changed the Yellow Men into Red Men. The Japanese were no longer a threat, while the Red Russians were. Not having a copy of the original March and August 1941 editions of Amazing Stories, to compare with the 1948 edition of Llana of Gathol, I was unable to confirm my theory and went to the only ERB expert I could think of, the amazing George McWhorter. It was his impression that Ray Palmer, who took over the Ziff-Davis pulp magazines in 1939 came up with the title “Yellow Men of Mars” because he thought it sounded catchy and would appeal to a wider reading audience. This answer was unappealing to me, so Mr. McWhorter then went to his favorite ERB historian, Bob Barrett. His answer appears to be dead on. Because, for whatever reason – probably color contrast with a snow-white background – J. Allen St. John chose to color the apt on the cover yellow instead of white. 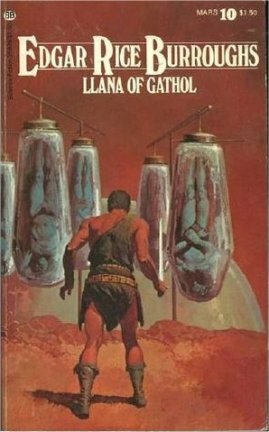 Wanting the cover to match with the title, Palmer called the story “The Yellow Men of Mars.” Bizarre, yes. Crazy, yes. But the truth is often stranger than fiction. The Hothouse Cities of Okar!